Experience the Dilworth Park Wintergarden this holiday season- a winter wonderland featuring inspiring horticulture displays, skating, shopping and more, all in the heart of Philadelphia! The Rothman Institute Ice Rink and the Rothman Institute Cabin are back for another season of winter fun at City Hall! After skating, stroll through the Made in Philadelphia Holiday Market in search of unique holiday gifts. And, new this year is the America's Garden Capital Maze created in partnership with Greater Philadelphia Gardens. The Rothman Institute Ice Rink Opens November 11! The Rothman Institute Ice Rink at Dilworth Park is an unparalleled entertainment experience on Philadelphia's center stage in a wonderfully unique urban setting. Open daily through February 26, 2017, admission is $3 for children ages 10 and under and $5 for adults. Skate rental is $10. Visit DilworthPark.org/rothmanicerink for special holiday hours, events, rental information, and more. Opening day will kick off the season with a salute to veterans and active military, including free skating with military ID until 11pm. Plus, on this special day, all opening day visitors to the Rothman Rink are encouraged to bring a non-perishable food item for the Liberty USO Thanksgiving Basket Drive. On opening day in the Rothman Cabin, Pour One Forward with Sam Adams- Buy two Boston Lagers... one to enjoy and one to leave for our military friends. Warm up with hot seasonal cocktails featuring Jim Beam Apple cocktails and Sam Adams craft beer and an artfully-crafted menu at Rothman Cabin with offerings from Air Grille by Brûlée Catering including items to savor and share such as poutine and chili. Brush up on your skating or just watch and enjoy the great food and drink. Adults 21 and over can enjoy a glass of wine, a specialty cocktail featuring Jim Beam, or a Sam Adams craft beer starting at 5pm on weekdays, and 11am on the weekends. New this year, a holiday-inspired Garden that was created in partnership with Greater Philadelphia Gardens. Located on the Greenfield Lawn, children and adults will delight in discovering picture-perfect moments amid the vibrant plantings, topiaries, twinkling lights, and décor that showcases all 32 public gardens, arboreta, and historic landscapes that are located within 30 miles of Philadelphia. Anchoring the center of the maze will be a welcoming gazebo. This Holiday season, visit the Made in Philadelphia Holiday Market at Dilworth Park, showcasing local artists, crafters, confectionaries and designers. The market will be open from November 19 through December 24. For a complete schedule, visit DilworthPark.org/madeinphiladelphia. Enjoy music recorded by The Philadelphia Orchestra as you skate every Sunday at the Rothman Rink. Then, once a month, visit the rink to see professional ice skaters perform to music by The Philadelphia Orchestra. From the folks that bring you Center City District Sips, enjoy this winter edition in the Rothman Cabin with $5 cocktails from Jim Beam and Effen Blood Orange, $4 wine and $3 Sam Adams drafts, along with specially-priced food items from the Dilworth Park Air Grille. College students show their ID and pay $2 for admission plus skate rental for an evening of fun with friends at the Rothman Rink. Discount cannot be used in conjunction with other offers. The Rothman Rink at Dilworth Park offers skating lessons for both children and adults. Basics are taught in 30-minute lessons, led by professional instructors. Participants will also receive a 5-visit punch card for public skating admission that is valid only during the 5-week Learn to Skate session. $99 per 5-week session. Includes lessons, admission and skate rental. Fill out this form or email Lessons@RinkManagement.com to sign up. All aboard! Santa Claus is comin' to the Rothman Rink at Dilworth Park on SEPTA! Board specially decorated SEPTA trains filled with entertainment for a fun-filled holiday ride to Dilworth Park. Visit SEPTA.org for train times and locations. A festive parade will welcome Santa, Mrs. Claus and the elves to the Rothman Rink, where riders are invited to stay and skate with Santa. The rink will be open 10am-11pm. on that day. Dilworth Park offers convenient access to SEPTA’s Broad Street, Market-Frankford and Trolley Lines. Multiple SEPTA Bus Routes stop at City Hall/Dilworth Park and Regional Rail is just steps away. 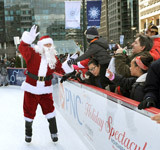 Visit ISEPTAPhilly.com to plan your trip to the Rothman Institute Ice Rink at Dilworth Park. Children's Discovery Garden and Imagination Playground, 10am-6pm, seven days a week. Coming in December - Brunch with Santa! This holiday season, have Brunch with Santa at the Logan Square Café in Sister Cities Park! A festive holiday horse-drawn carriage ride around Logan Circle is included with brunch! December 10 and 17, seatings at 9am and 11am. $15.95 for children 12 and under, $22.95 for adults, FREE one year and under. Reservation required. Children one year and under must purchase a ticket if they require a seat. Click here for tickets and menu information. John F. Collins Park is a small quiet oasis off busy Chestnut Street in Center City Philadelphia. It's a relaxing spot for lunch, reading, or just enjoying a beautiful day. Through the generosity of the William Penn Foundation, the Center City District has restored the park's fountain, benches, landscaping and lighting. John F. Collins Park is owned and operated by the Center City District Foundation. Now offering beer, wine and cocktails after 11am!